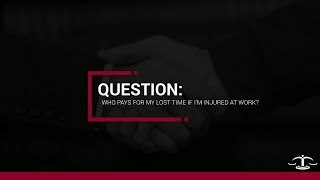 Who pays for my lost time if I'm injured at work? Who pays for my permanent problems if I'm injured at work? What if I can't return tp the same type of work after I'm Injured? 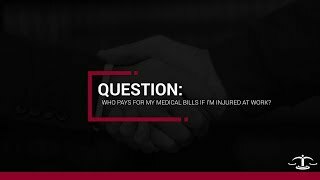 Who Pays for my medical bills if I'm injured at work? Q: Are You Covered by Workers’ Compensation? Check the workers’ compensation law of your state to see whether these exclusions affect you. Federal government employees are also excluded from state workers’ compensation coverage, but they receive workers’ compensation benefits under a separate federal law. In addition, some states do not require workers’ compensation coverage of employers having fewer than a designated number of employees — three to five, depending on the state. So, if you work for one of these employers, you may be excluded from the state program. Q: Do I need a lawyer to receive a workers’ compensation claim? In my opinion, every injured worker requires legal assistance for a work related injury, especially because the new workers’ compensation laws are difficult for an injured employee to navigate on their own. Remember, a lawyer is paid only when they recover money which an injured worker cannot receive on their own. There is no risk in seeking assistance for work related injuries so the majority of injured employees hire an attorney. Disclaimer: The content contained in this column is for informational use only and not for the purpose of providing legal advice. You should not rely upon the information discussed in this column for an analysis of your legal issue. If you have a legal question, please call the Ankin Law Office for a confidential telephone consultation; toll-free: (844) 600-0000 Local: (312) 600-0000. Please feel free to visit our website at: ankinlaw.com. Q: How does a work injury claim get started? Usually an injured worker will alert his/her employer of their injury and the employer will assist or direct the employee to emergency medical treatment and prepare the appropriate paperwork for the claim. If the employer does not start the claim, the employee can file a form called application for adjustment of claim with the Illinois Worker Commission, which will start the claim. Q: How do I see a doctor? Under Illinois law, the injured employee has the right to receive emergency medical treatment; after that the employer should provide the injured employee with a list of preferred medical providers they can use to seek additional medical treatment. As the injured worker, you have the right to reject the preferred providers list in writing and be treated by a doctor of your choice. The injured employee can then receive all reasonable and necessary treatment from any doctor referred from the first doctor or through their referral chain. Q: Will I lose my job if I pursue workers’ compensation benefits? The law is clear that a person cannot be retaliated against while pursuing a workers’ compensation claim. If an employer fires or discharges an employee under these circumstances, they are subject to additional legal action. In my experience, the system works; retaliation is rare and an employee shouldn’t be concerned about losing their job because they file a workers’ compensation claim. Q: Do workers that are not properly documented but are injured at work have the right to receive workers’ compensation benefits? Under Illinois law, anyone who is injured at work has the right to pursue workers’ compensation benefits. Immigration status does not matter as all workers have the right to pursue workers’ compensation benefits. If an employer hires a worker, the employer can’t benefit after the worker is hurt by saying that the employee was an illegal and shouldn’t receive workers’ compensation benefits. Q: If I am injured and need to receive Workers’ Compensation, what benefits should I expect? The right to receive money to compensate for permanent injures when you can’t permanently return to work; you may also have the right to vocational retraining and loss of income damages. Workers’ compensation is insurance coverage for an employee who has suffered an injury or illness resulting from job-related duties. Coverage includes medical and rehabilitation costs and lost wages for employees injured on the job. The benefits are based on the type and severity of the injury. The law states that the worker must receive these benefits; there is not a choice by the employer or employee as to whether or not the employee should get these benefits. Q: Are all on-the-job injuries covered by workers’ compensation? injuries suffered when an employee’s conduct violated company policy. Q: What if my employer tells me not to file a workers’ compensation claim or threatens to fire me if I do? In most states, it is a violation of the workers’ compensation laws to retaliate against an employee for filing a workers’ compensation claim. If this happens, immediately report it to your local workers’ compensation office. For more information on workers’ compensation benefits, contact your state’s workers’ compensation office. Or, if you live in California and are filing a workers’ compensation claim, refer to California Workers’ Comp: How to Take Charge When You’re Injured on the Job, by attorney Christopher Ball (Nolo). Q: Does workers’ compensation cover only injuries or does it also cover long-term problems and illnesses? Your injury need not be caused by an accident — such as a fall from a ladder — to be covered by workers’ compensation. Many workers receive compensation for injuries that are caused by overuse or misuse over a long period of time — for example, repetitive stress injuries such as carpal tunnel syndrome or back problems. You may also be compensated for some illnesses and diseases that are the gradual result of work conditions — for example, heart conditions, lung disease, and stress-related digestive problems. Q: Do I have to be injured at my workplace to be covered by workers’ compensation? Q: Can I ever sue my employer in court over a work-related injury? Yes. If you are injured because of some reckless or intentional action on the part of your employer, you can bypass the workers’ compensation system and sue your employer in court for a full range of damages, including punitive damages, pain and suffering and mental anguish. Q: What kind of benefits will I receive? The workers’ compensation system provides replacement income, medical expenses, and sometimes, vocational rehabilitation benefits — that is, on-the-job training, schooling, or job placement assistance. The benefits paid through workers’ compensation, however, are almost always relatively modest. If you become temporarily unable to work, you’ll usually receive two-thirds of your average wage up to a fixed ceiling. But because these payments are tax-free, if you received decent wages prior to your injury, you’ll fare reasonably well in most states. You will be eligible for these wage-loss replacement benefits as soon as you’ve lost a few days of work because of an injury or illness that is covered by workers’ compensation. If you become permanently unable to do the work you were doing prior to the injury, or unable to do any work at all, you may be eligible to receive long-term or lump-sum benefits. The amount of the payment will depend on the nature and extent of your injuries. If you anticipate a permanent work disability, contact your local workers’ compensation office as soon as possible; these benefits are rather complex and may take a while to process. must be expected to last at least twelve months or to result in death. If you think you may meet the above requirements, contact your local Social Security office. Q: Can I be treated by my own doctor and, if not, can I trust a doctor provided by my employer? In some states, you have a right to see your own doctor if you make this request in writing before the injury occurs. More typically, however, injured workers are referred to a doctor recruited and paid for by their employers. Your doctor’s report will have a big impact upon the benefits you receive. Keep in mind that a doctor paid for by your employer’s insurance company is not your friend. The desire to get future business from your employer or the insurance company may motivate a doctor to minimize the seriousness of your injury or to identify it as a preexisting condition. For example, if you injure your back and the doctor asks you if you have ever had back problems before, it would be unwise to treat the doctor to a 20-year history of every time you suffered a minor pain or ache. Just say “no” unless you really have suffered a significant previous injury or chronic condition. Q: If I am initially treated by an insurance company doctor, do I have a right to see my own doctor at some point? State workers’ compensation systems establish technical and often tricky rules in this area. Often, you have the right to ask for another doctor at the insurance company’s expense if you clearly state that you don’t like the one the insurance company provides, although there is sometimes a waiting period before you can get a second doctor. Also, if your injury is serious, you usually have the right to a second opinion. And in some states, after you are treated by an insurance company’s doctor for a certain period (90 days is typical), you may have the automatic right to transfer your treatment to your own doctor or health plan, while the worker’s compensation insurance company continues to pay the bill. Because the insurance company is paying, don’t hesitate to go to a doctor who specializes in your injury or illness — even if the cost is great. To understand your rights, get a copy of your state’s rules or, if necessary, research your state workers’ compensation laws and regulations in the law library. Q: Who pays workers’ compensation benefits? When a worker is injured, his or her claim is filed with the insurance company or self-insuring employer, which pays medical and disability benefits according to a state-approved formula.